FOR her eminent service to the people of Tasmania over many years, state governor and former New Norfolk woman Kate Warner has received the nation's highest civilian award in today's Australia Day Honours List. Professor Warner is one of just 10 new Companions of the Order of Australia. 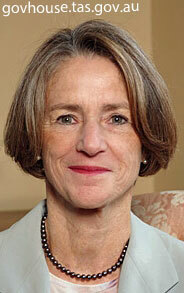 A 44-year resident of New Norfolk until being appointed Governor of Tasmania in 2014, Professor Warner's elevation from Member of the Order of Australia to Companion of the Order is in recognition of her leading contributions to the legal community, particularly to law reform; to higher education as an academic, researcher and publisher; and as a supporter of the arts, and environmental and social justice initiatives. 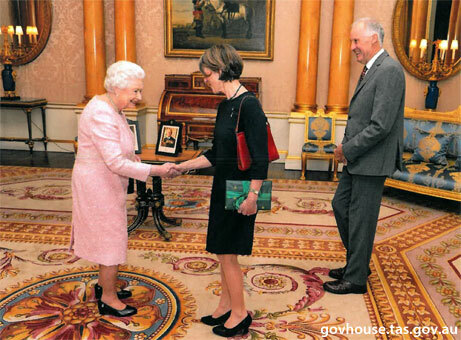 Professor Warner and her husband Richard had an audience with the Queen in 2015 and in late 2016 Professor Warner served as Administrator of the Commonwealth during the Governor-General's absence. Governor of Tasmania, since 2014. University of Tasmania: Emeritus Professor of Law, Faculty of Law, since 2014; Chair, Advisory Board, Peter Underwood Centre for Educational Attainment; Member, Advisory Board, Institute for the Study of Social Change. Foundation Director, Tasmania Law Reform Institute, 2002-14. Member, Board of Legal Education, 1991-2014. Member, Council of Law Reporting, 1991-2014. Commissioner, Tasmanian Gaming Commission, 2001-14. Member, Tasmanian Sentencing Advisory Council, 2010-14. Alcorso Foundation patron (current) and president, 2010-14. Patron in Chief, Education Ambassadors, since 2015. The Queen received Professor and Mr Warner at Buckingham Palace in 2015.